When we started our series on Genesis, we started with man’s rebellion against God. We have looked at the whole question about man and free will and we said that Adam as sinless man before the fall was able to sin. For God said, “In the day that you eat of it you shall surely die” (Gen.2:17). As soon as Adam fell, sinful man was not able not to sin, since we were unbelieving, and “whatever is not from faith is sin” (Rom.14:23). We also saw that when we are born again by the power of the Holy Spirit, we are able to not sin, for “sin will have no dominion over you” (Rom.6:14). This means that what Paul calls “the natural man” or “the mind of the flesh” is not able not to sin (Rom.8:7-9). 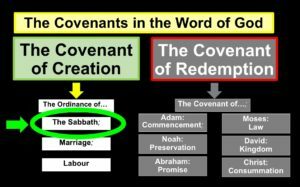 On previous occasions we briefly looked at covenants and we saw that Scripture is full of references to covenants, but what exactly is a covenant? We can define a covenant as follows: “A covenant is a bond in blood sovereignly administered.” Whenever God enters into a divine covenantal relationship with man, He sovereignly institutes a life-and-death bond. A divine covenant is therefore a bond in blood, or a bond of life and death, sovereignly administered. This is crucial to remember: It is a solemn agreement, of life and death and blood is always present as a sign of the covenant. A bond-in-blood, most importantly, cannot be initiated by man. It is always God that administers a covenant with man – a sovereign act from God (this includes the new covenant – later more about that). Before we commence with Genesis and the fall of man, I want us to briefly look at the types of covenants in the Word of God. Today we will be looking at: The Covenant of Creation. 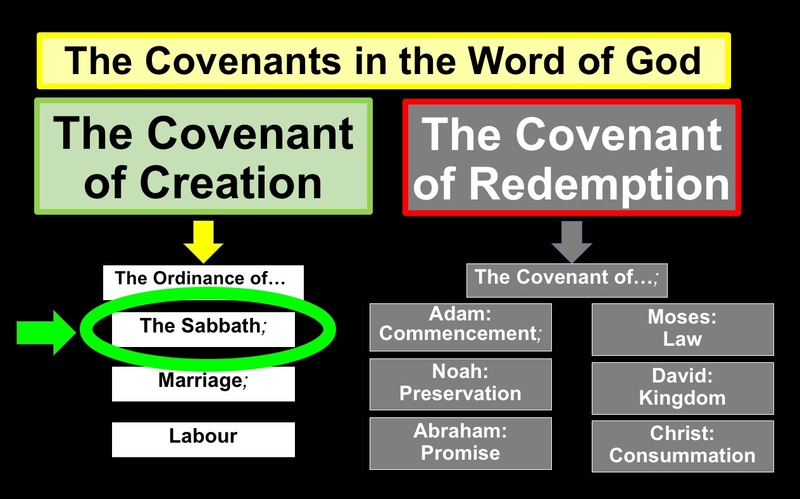 Then we will look at The Covenant of Redemption, with sub-headings – Adam: The Covenant of Commencement; Noah: The Covenant of Preservation; Abraham: The Covenant of Promise; Moses: The Covenant of Law; David: The Covenant of the Kingdom and Christ: The Covenant of Consummation. By creating man in God’s own likeness and image, God established a unique relationship between Himself and creation. Through this created relationship, God established sovereignly a life-and-death bond. This original bond between God and man may be called the “Covenant of Creation” (Afrikaans: “Die Skeppingsverbond”). Man, as part of creation, is responsible to obey the ordinances embedded in creation’s structure. Three ordinances, inherent in God’s creational orderings which deserve our proper attention, are the Sabbath, marriage and labour. These three ordinances are part and parcel part of the Covenant of Creation. We must also note that God, from the very beginning, set a distinctive blessing on the Sabbath. That is why the fourth commandment of the Decalogue (the Ten Commandments) commands man to rest on the seventh day of the week, by remembering it and by sanctifying it (Ex.20:8, 11). Just as God choose to rest from His labour on the seventh day in order to be refreshed (Ex.31:17), so man must seize from his work, so that he can be refreshed ~ “Six days you shall do your work, but on the seventh day you shall rest; that your ox and your donkey may have rest, and the son of your servant woman, and the alien, may be refreshed” (Ex.23:12). By sanctifying the Sabbath, God has indicated that he expects men regularly to bring themselves as well as the fruit of their labour to be consecrated before Him. This Sabbath principle manifested itself in a variety of ways among God’s people. Not only did Israel celebrate a “Weekly Sabbath.” The nation was instructed in addition to celebrate both a “Sabbath Year” (Lev.25:1-7) and a “Jubilee Sabbath” (a.k.a. “Jubilee Year” – Lev.25:8-22). The purpose of Israel’s Sabbath observance was to teach them about sanctification – namely their sanctification. God said that Israel was to observe the Sabbath perpetually (Afrikaans: “deurlopend”) ~ “Above all you shall keep my Sabbaths, for this is a sign between me and you throughout your generations, that you may know that I, the Lord, sanctify you” (Ex.31:13). Just as God had set the seventh day apart from the other six at creation, so He had set Israel apart by His divine calling and their deliverance at the Exodus. The godly Israelite, who wished to observe the Sabbath with his whole heart, would meditate on what God intended them to do in order to keep the Sabbath as a holiday. In so doing he would also be learning much about what it meant for him to keep himself holy as well. The keeping of the Sabbath thus became an object lesson in sanctification. Just as God instituted a weekly rest of the Sabbath Day (Ex.23:12), He also instituted a Sabbath Year to be celebrated every seventh year (Lev.25:1-4, Ex.23:10-11). This was a sabbatical year of rest consecrated to God, in which His providence was depended upon for survival and His Lordship recognised in all areas of life. God promised to perform a miracle by granting abundant crops in the sixth year of the cycle so that the bounty would be sufficient until a new crop could be harvested two or three years later. This would be a continuing witness of God’s power as Provider similar to the manna in the wilderness (Lev.25:20-22). During the Sabbath Year, slaves were set free (Ex.21:2-6), debts owed to/from fellow Israelites, but not Gentiles, were cancelled (Deut.15:1-6) and the land was not ploughed or harvested; however, the farmer, the poor and animals could eat of anything that grew without being re-planted (Ex.23:10-11; Lev.25:1-7). In addition to the Sabbath Year, God instituted the Jubilee Year to be celebrated every 7x7th year (Lev.25:8-13). It represented a perfection of the Sabbath Year legislation and provided for a double portion of rest. That is, each 49th year (i.e., after 7 occurrences of the 7 year Sabbath; 7 x 7 = 49) would be a Sabbath Year, followed by a Jubilee Year in the 50th, so that for two consecutive years the people would be bound to restore the land, personal and economic freedom and to depend on God. In Is.61:1-3, we see that the prophet used this sabbatical imagery, to describe the proclamation of liberty associated with the coming of the anointed Messiah and Jesus used this same imagery and Isaiah’s prophecy to characterize His ministry. Another very interesting fact, is to see how the Sabbath also relates to history and one can clearly see the pattern of progress in God’s dealings with His people through the entire human history. We see this principle in Israel’s conquest under Joshua. Israel moved from captivity in Egypt through wandering in the wilderness toward “rest” in Canaan. Moses anticipated this “rest” in Deut.12:9-10 ~ “…for you have not as yet come to the rest and to the inheritance that the Lord your God is giving you. But when you go over the Jordan and live in the land that the Lord your God is giving you to inherit, and when he gives you rest from all your enemies around, so that you live in safety.” The New Testament interprets this history explicitly in terms of the Sabbath principle. Because Joshua could not give Israel “rest” (due to the nation’s sin in the wilderness), a “Sabbath” yet remains for the people of God ~ “For if Joshua had given them rest, God would not have spoken of another day later on. So then, there remains a Sabbath rest for the people of God” (Hebr.4:8-9). We see therefore, that the Sabbath plays a prominent role in determining Israel’s history. Israel’s seventy years of captivity are also interpreted by Scripture in terms of the Sabbath principle ~ “And I will scatter you among the nations, and I will unsheathe the sword after you, and your land shall be a desolation, and your cities shall be a waste. Then the land shall enjoy its Sabbaths as long as it lies desolate, while you are in your enemies’ land; then the land shall rest, and enjoy its Sabbaths. As long as it lies desolate it shall have rest, the rest that it did not have on your Sabbaths when you were dwelling in it” (Lev.26:33-35). Eschatological expectations for God’s people also relate to the Sabbath principle. As Daniel contemplates the end of the 70 Sabbaths of Israel’s captivity, he receives his revelation concerning the “seventy sevens” yet to come (Dan.9). In the light of these very truths, we as New Testament believers cannot just negate or abolish the significance of the Sabbath, because, when doing that, we breach and deny the very important role that the Sabbath played in the creation, history and eschatology. We as new covenant Christians should rather rejoice in the privileges associated with God’s perfect Sabbath-ordinance. BUT, our appreciation and joy must not be focussed and applied on and in the maintaining of Sabbatical traditions, etc., but rather in the realisation of a new goal. As rest always remained ahead of the Israelites, eternal rest awaits all of us under the new covenant. Under the old covenant, as with creation, redemption was always the final outcome. The “forward-looking character” of a seventh-day Sabbath anticipated the day of redemption’s consummate restoration (Afrikaans: “uiteindelike volmaakte en volkome herstel”). It is very important to realise that “Sabbath-observance” not only relates to creation (six day creation – seventh day rest), but also to redemption. Creation originates a people of God, whilst redemption recreates a people of God. In each case the Sabbath plays a very important role. By Christ’s resurrection from the dead, He consummated (Afrikaans: “voltrek/afhandel”) God’s redemptive purposes. His coming forth into new life must be understood as an event as significant as the creation of the universe. By His resurrection, a new creation occurred. The original creation launched the world. But the “resurrection-creation” brought the world to its destined perfection. We as new covenant believers therefore look at history in a different way than “the world.” We not only look forward to a future Sabbath rest, but we also look back on a redemption fully accomplished. We firmly stand on the basis of what the past already has brought and the implication of this, is that the new covenant has radically altered the Sabbath perspective for us. The question is whether we as Christians must honour the Sabbath? According to the website “Got Questions” (and I concur with this), many people make the common error by saying that the Sabbath was the day of worship. Groups like the Seventh Day Adventists hold that God requires the church service to be held on Saturday, the Sabbath day. That is not what the Sabbath command was. The Sabbath command was to do no work on the Sabbath day (Ex.20:8-11). Nowhere in Scripture is the Sabbath day commanded to be the day of worship. According to Acts 2:46-47, the early Christians met every day of the week – not only on the Sabbath ~ “Every day they continued to meet together in the temple courts. They broke bread in their homes and ate together with glad and sincere hearts, praising God and enjoying the favour of all the people. And the Lord added to their number daily those who were being saved.” If there was a day that Christians met regularly, it was the first day of the week (our Sunday), not the Sabbath day (our Saturday) (Acts 20:7; 1 Cor.16:2). In honour of Christ’s resurrection on Sunday, the early Christians observed Sunday not as the “Christian Sabbath” but as a day to especially worship Jesus Christ. By saying ~ “The Sabbath was made for man, not man for the Sabbath” in Mark 2:27, Jesus was restating the principle that the Sabbath rest was instituted to relieve man of his labours, just as Jesus came to relieve us of our attempting to achieve salvation by our works. We no longer rest for only one day, but forever cease our labouring to attain God’s favour. Jesus is our rest from works now, just as He is the door to heaven, where we will rest in Him forever. There is no other Sabbath rest besides Jesus. He alone satisfies the requirements of the Law, and He alone provides the sacrifice that atones for sin. He is God’s plan for us to cease from the labour of our own works. Another misconception is the using of the term, “The Lord’s day” for Sundays. The term “Lord’s day” is used only once in Scripture – nowhere else. Rev.1:10 says, “I was in the Spirit on the Lord’s day, and I heard behind me a loud voice like a trumpet.” Since the apostle John does not elaborate on the meaning of “Lord’s day,” we can assume that his target audience, first-century Christians, were already familiar with the expression Sunday, because Sunday was the day that Jesus Christ rose from the dead, an act that forever separated Christianity from any other religion (Joh.20:1). Since that time, believers have gathered on the first day of the week to celebrate His victory over sin and death (Acts 20:7; 1 Cor.16:2). Even though the Sabbath day was designated by God as a holy day, Jesus demonstrated that He was Lord over the Sabbath (Matt.12:8). Yes, Jesus kept the Sabbath. He kept all the Jewish laws, because he was born under the law and kept it perfectly (Gal.4:4; Heb.4:15). He killed Passover lambs, tithed to the Levites, told cleansed people to make offerings commanded by Moses (Matt.8:4), and he observed Hanukkah (Joh.10:22 – “The Festival of Dedication”). He would have worn blue threads on His garments (Num.15:38) and done a lot of other things that Christians aren’t required to imitate. When we look at the example He set, we must remember the historical context. What kind of example did Jesus set on the Sabbath? The Bible never says that He rested – we are told only of His activity. He never commands anyone to keep the Sabbath, nor praises anyone for it. Rather, He constantly criticised people who had rules about what could or could not be done on the Sabbath. He always taught more freedom, never any restrictions. Although He told people to be very strict about some laws (Matt.5:21, 28, etc. ), He was always liberal about the Sabbath. Jesus always compared the Sabbath to ceremonial laws, not to moral laws. When His disciples were picking grain, He used the example of the showbread, and the work of the priests in the temple (Matt.12:3-6). Those rituals were just as important as the Sabbath. He said that circumcision could be done on the Sabbath (Joh.7:22), which indicates that circumcision is a more important law than the Sabbath. The Sabbath is a ritual law – it says that behaviour that is perfectly good one day, is forbidden on another, simply because the earth has rotated. But true morality does not change from one day of the week to another. When ritual laws became obsolete (Afrikaans: “uitgedien/oorbodig”) when Jesus died, it should be no surprise that the ritual of the Sabbath also became obsolete. Jesus said that daily chores could be done on the Sabbath (Luke 13:15). Even hard labour could be done in an emergency (Luke 14:5). He told a healed man to carry his sleeping mat, even though there was no hurry (Joh.5:8). He even used the word “work” to describe his activity (vs.17). Many Christians follow this example. They remember that Jesus consistently criticized the Sabbath rules of the Pharisees, and that He treated it as a ritual law. When Paul was preaching the Gospel in a new city, his custom was to go to the synagogue on the Sabbath (Acts 13:14; 16:13; 17:2). But this does not mean that he kept the Sabbath. Paul wanted to preach to Jews first, and the best place to do this was in a synagogue, and the best day to do it was the Sabbath, when the Jews were there. It was simply a good evangelistic strategy to go to the synagogue on the Sabbath. However, Paul never taught anyone to keep the Sabbath. Paul sometimes kept Jewish laws such as circumcision, making vows, and participating in temple rituals (Acts 16:3; 18:18;21:26). When he was with Jews, he lived like they did – but he did not consider himself to be under the old covenant law (1 Cir.9:20). When with Gentiles, he could live like a Gentile, just as Peter could (Gal.2:14). In the first century, neither Jews nor Gentiles believed that Gentiles should keep the Sabbath. If Paul had a different view, we should expect to see some evidence, but there is none. The Sabbath has nothing to do with salvation, and nothing to do with the Gospel of Jesus Christ. It was never part of the message of the New Testament church. The message is always one of liberty, never one of restrictions on a particular day of the week. God accepts us because of Jesus Christ, not because of anything that we do. It is by grace, not works. We are to trust in Christ for our salvation. John Piper sums up the reasons why Christians go to church on a Sunday as follows: We as Christians are people who have believed in Jesus Christ as the Son of God who died for their sins, who rose again from the dead, who reigns in heaven today, and who will come again, and we are trusting Jesus day by day as our Saviour from sin and judgement and as our supreme authority and as our greatest Treasure. Coming together as church, is essential to giving expression to the fact that Jesus died to create a united people, not just isolated Christian individuals. So, we find in the Bible then descriptions of those first century Christians gathering regularly. This is what the question is about. Why do we go to church? In 1 Cor.11:81 it says ~ “In the first place, when you come together as a church…” Or 1 Cor.14:23 ~ “If, therefore, the whole church comes together.” These texts are then followed by instructions for how to behave ourselves in the gathered church. Then we find indications or instructions in the Scriptures of what we should do when we come together. All of these instructions in the Bible flow from the fact that Jesus is alive; Jesus is worthy of receiving our regular, corporate attention and worship. In other words, these things that the Bible says we should be doing are not arbitrary. They are organically related to the fact that Christians know and love and follow the living person of Jesus Christ, who died to create a people for Himself, a worshiping people. A Sunday must be a day of celebration for all believers – a celebration of our salvation; a celebration of the fact that our Redeemer has risen from the dead; a celebration of our eternal end-destination and because of this, we should preferably (this is not a law or an ordinance) not do on a Sunday as the world does – our focus should be on the risen Saviour on this glorious Resurrection Day (Sunday). Such an attitude is and will be a testimony to the world of our new identity in Christ Jesus. So, let me sum it up like this. The reasons Christians go to church on Sunday is because we have been rescued from our sins, united with a risen, living Christ and with each other through faith in Jesus. And because of that union with Jesus and with each other, the Bible, God’s Word, calls us to regular, weekly expressions of our corporate joy and thankfulness before God in worship, not just isolated Christian individuals scattered around, but corporate gatherings praying and singing and hearing God’s word and celebrating the ordinances of Jesus. Next week we will Lord willing look at the Ordinance of Marriage and the week after that, the Ordinance of Labour.